Every summer, my husband looks forward to severe thunderstorm season. I think the cartoon sums it up best- he is the guy sticking his head out the window with his video camera in the middle of 70 mph winds, searing rain and cloud to ground lightning. Last night, the Twin Cities area (specifically the northern suburbs) got hit with two lines of severe storms. The first brought with it golf ball sized hail. 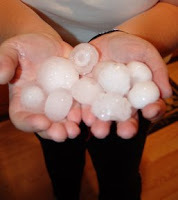 While that isn't normally that huge a deal, the fact that it hailed that size hail for more than 15 minutes is. How the windows didn't shatter is beyond me. It was the loudest, scariest noise I have ever heard hitting my house and the first time I have taken cover since I was maybe a small kid. My dog and I hovered in the basement hallway not sure whether the windows would break or the roof would cave in. It was surreal. That was just the first storm. The next one to come along wasn't as exciting- a lot of lightning, some good wind gusts and a LOT of rain. We were grateful that our windows stayed in tact- I'm not sure how we would've managed the next set of storms had we sustained more damage. On the negative side, one of our gutters busted a leak and water was absolutely spewing everywhere from it. Not good. After getting to bed at 1am and up again at 5:30a for work, the morning light showed what damage was done. As if it were a fall day, there were leaves everywhere littering yards and streets. Leaves lined up in perfect rows on the yards marking how far the flood line extended. Our house showed the large indentations from the golf ball sized hail that pummeled it for 15+ minutes straight. The roof damage has yet to be assessed. Shock and awe at the power of the storm were evident by the looks on our faces. We are lucky it wasn't worse. Our family is still safe and our home is still safe. I tell this story, because I tease my husband about his obsession with videotaping storms. Mostly, he is a weather nerd and is amazed by them and wants to get as many hits on YouTube as humanly possible. For once, his nerdiness came in handy. The insurance company will be unable to deny our claim for new siding and a possible new roof because we have the entire storm on video. One more drink saved my husband's life.